Your Liebherr WKt 5552 GrandCru is guaranteed to be the lowest price in the UK. The price includes installation, a digital hydrometer and vibration reduction blocks. The WKt 5552 has a 'terra' metal steel cabinet with a insulated glazed door. It has a storage capacity of 253 bottles comprised of 1 zone. Of it's type the WKt 5552 is the most energy efficient with an A+ energy rating. Comparing online prices you will find out that Cavepromotor has the best prices in The UK. The Cavepromotor origins are in the wine industry, therefore we are continuously concerned about the perfect storage and serving of your wines. To control the level of humidity, Cavepromotor includes a digital hygrometer. Beside that, Cavepromotor includes a set Vibration Reduction Blocks (*) free of charge. So while comparing be aware that you compare 'apples to apples'. In addition, and as part of our service strategy, our wine Specialists are available with advise and best practice information, before and after your wine cabinet purchase. 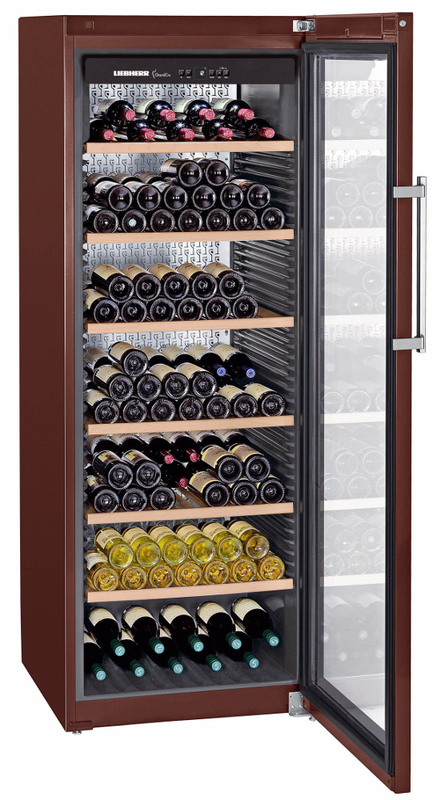 Liebherr wine cabinets & fridges are the only manufacturer Cavepromotor sell and because of this we can purchase the Liebherr WKt 5552 GrandCru for the very best price. Also Cavepromotor does not pay for any additional marketing or to any of the online comparison sites. (*) The Vibration Reduction Blocks are developed and produced exclusively for Cavepromotor and sold in the countries where Cavepromotor provides freestanding wine cabinets like the Liebherr WKt 5552 GrandCru. Liebherr is using low-vibration compressor in the wine cabinets and fully vibration dampened parts. But there are always environmental vibrations that can harm your wines. To neutralize the vibrations the free standing wine cabinets are placed on Vibration Reduction Blocks. N.B. Vibration Reduction Blocks can be purchased with Cavepromotor for £325 per set. The picture on the right shows the Vibration Reduction Blocks (VRB) beneath an empty Liebherr WKt 5552 GrandCru. Once the Liebherr WKt 5552 has settled on the VRB it will sink down in to them. Before any weight is placed upon the VRB they measure 1.5cm in height. The digital hygrometer helps you to monitor the humidity level inside your wine cabinet. What would be the ideal level of humidity? Different wine experts share different opinions. To be on the safe side we at Cavepromotor recommend a range between 50% and 75%. Keeping the level too low will affect the cork, too high will result in moulded labels. Every wine cabinet has a climate indication and for the Liebherr WKt 5552 it is: SN-ST.
We carefully handle your wine cabinet, it this all starts with robust packaging to ensure no damage occurs on delivery. One of the common issues we handle is the entrance to your home, to be sure we can deliver safely the wine cabinet to the exact location where you wish it installed. Please advise us prior to delivery, should there be an issue at the entrance to your home with these stated dimensions. The location of the WKt 5552 can not be underestimated. In the product information it will list the width when the door is opened to 90 degrees. For ease of use and to be able to adjust the shelves it is advisable to open the door to 115 degrees but by doing so it adds an extra 20 - 25cm to the width. If you position your Liebherr WKt 5552 GrandCru cabinet in between unit’s to give the appearance of being built in then a gap of 5cm is required above the appliance for ventilation purposes. If this gap is not left then it may void your warranty (be aware of the extra 1.5cm the Vibration Reduction Blocks will add to the height). Another issue to mindful of is if the Liebherr WKt 5552 is positioned next to a freezing appliance then condensation could form on the outer cabinet. We recommend leaving a gap of 3cm between the Liebherr WKt 5552 GrandCru and unit.